The Department of Physics started its functioning in 1996. The Department offers a four – Semester M. Sc. 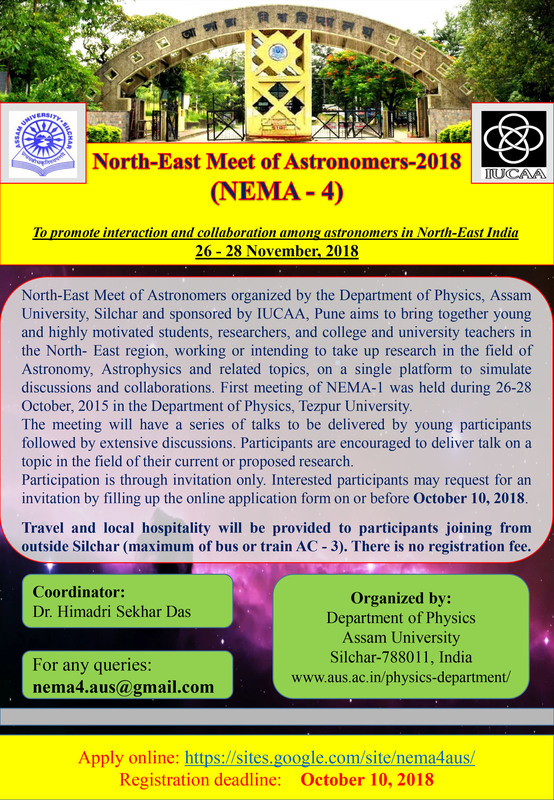 programme (Two years duration) where the students at present can opt for one of the two specializations – i) Astrophysics and ii) Condensed Matter Physics, with laboratory classes. Research areas that are covered at present include – Astrophysics, Particle Physics, Cosmology, Chemical Physics (with application to biomolecules), Atmospheric Physics.The Department possesses a number of sophisticated instruments that includes 16 inch Mead Telescope, 14 inch Celestron Telescope, Astronomical CCD, Photometer, Ellipsometer, FTIR, UV visible spectrophotometer.The Department also has a cluster computing facility. Notice Regarding Open Choice Paper. Alumni of the department of Physics of Assam University are now serving as faculty members researchers in universities, colleges and research institutions in different parts of the country and outside and also in several industrial organizations. Many of the former students of the Department have also qualified in competitive examinations like JRF, GATE and GRE, and are pursuing advanced courses.